This tour highlights the downtown core and is easily done on foot by most people. The total walking distance over the day is about 10 km (just over 6 miles). The tour completes a circuit from Yonge Street to Queen Street to Spadina to Dundas Street and back to Yonge (see map). Of course, the length of the tour depends on how long you spend at each point. Some tourists never make it past the morning visit to the shopping mall! If you're looking for a cheerful, no-nonsense breakfast join, Sunset Grill is a good choice. Fuel up for your day of walking with huge portions of standard breakfast fare including omelets, pancakes and eggs benedict. 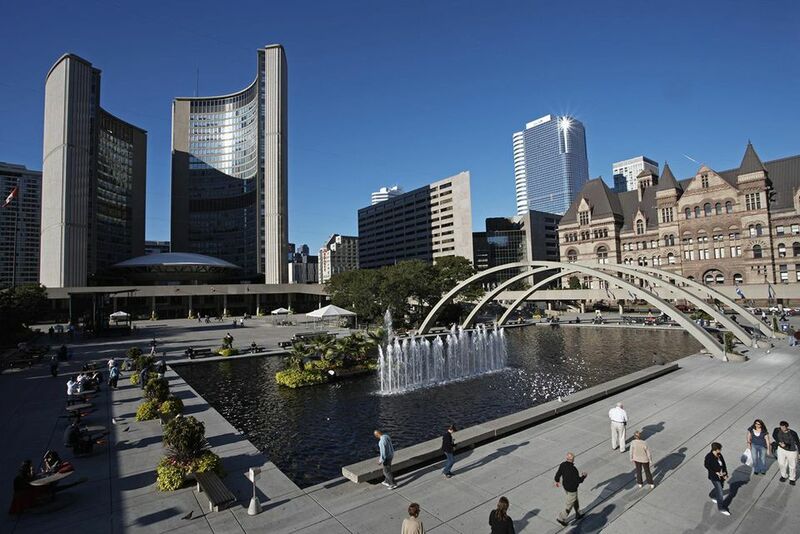 The central location leaves you with a short stroll down Yonge Street to the Eaton Centre. Alternatively, start your day at the St. Lawrence Market at the corner of Front Street and Jarvis. Meander the stalls of fresh foods. Have a sit-down breakfast or grab something to go. Open every day except Sunday & Monday. From St Lawrence Market, head west to Yonge Street and north toward Queen Street. The Toronto Eaton Centre is a popular tourist choice, as it features over 300 stores in a four-level glass-domed retail complex. Hanging from the ceiling is a spectacular mobile of a flock of Canadian geese by Canadian artist Michael Snow. Level 2 features a tourist info service, with free maps available. Exit the center on Queen Street and turn right, heading west toward Spadina. Walking down Queen Street, Old City Hall (1899) is on the right and is immediately contrasted by the contemporary city hall. Star Trek fans may recognize the new city hall as it was featured in an episode of Star Trek: The Next Generation. On the left is Canada's oldest corporation, the Hudson Bay Company, and its flagship store, the Bay. If you haven't had your fill of shopping, stop here. The department store features a variety of Canadiana, including t-shirts and mittens featuring the iconic maple leaf and most notably the colorful striped HBC Point Blanket, originally created in the 1600s for fur traders. Continuing west, Queen Street begins to become more akin to New York City's Soho district. Queen Street is unabashedly hip, featuring an eclectic mix of galleries, boutiques, trendy eateries, and bargain buys. Walk along Queen until you run into Spadina, turn right, heading north to Dundas. Once Queen Street hits Spadina, you are in the heart of bustling Chinatown and endless lunch possibilities. Budget choice lunch spot is Chinese Traditional Buns (Read review) at 536 Dundas W. Two can easily re-fuel for under C$20. If it's a particularly nice day and you want to stay outside, or if you really want to save on cash, pick up a Vietnamese Sub for C$1.50 at Banh Mi Nguyen Huong, 322 Spadina (left-hand side). You also have the option to stay inside and indulge in their delicious dim sum. Almost any of the restaurants along Spadina that are busy are bound to be good. Most have menus and prices posted in the window. Turn right and head east on Dundas toward the Art Gallery of Ontario. After the AGO, either grab a drink at one of the trendy eateries on nearby Baldwin Street or head east down Dundas back to Yonge. If you're too tired or hungry to walk, grab a Dundas streetcar. After a long day of sightseeing, Baton Rouge is a warm, cozy place to settle down for a leisurely dinner. This export from Montreal is a hot spot for locals and tourists alike. Famous for its slow-cooked ribs and steaks, the restaurant offers a wide selection of stir-fries, salads, seafood and more. Alternately, if you want to indulge in culinary excellence while getting a panoramic view of the city, make reservations well in advance for Canoe, the 54th-floor restaurant famously known as the city's (and one of the country's) best for 20 years. If your funds are depleted, fear not. A wide variety of ramen bars, Middle Eastern take-out joints or even the renovated Eaton Centre food court will satisfy you and go easy on your wallet. For example, two can dine at Sansotei Ramen, including a beer, for under $40, tip included. Finish your night off with some great Swing Jazz and Jump Blues at the intimate Reservoir Lounge at 52 Wellington Street East. From Monday to Saturday of every week, enjoy a different band for each night of the week. Like what you hear? You'll always know where and when to find them. The Reservoir Lounge has seen its share of celebrities, including Tom Jones who gave an impromptu performance for more than two hours. Cover charge Cdn$5 - Cdn$10, depending on​ the night. Call 416-955-0887 for more details. 10 Toronto architectural highlights from the quaint to the bizarre.